If you're on the phone a lot during the day, and also like listening to music, the Jabra Halo Smart neckband-style Bluetooth headphones are a great choice, with great sound, great battery life, and a smart design. 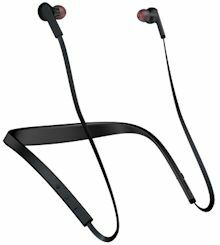 These have a U-shaped neckband to store the electronics and battery needed to get you through the day, with up to 17 hours talk time and 14 hours of music playback. The neckband also vibrates to alert on an incoming call. The earphones are mounted on short 8 inch cords, and have magnetic sleeves that snap together around your neck or attach to the neckband to store out of the way when not in use. As you might expect from Jabra, the Halo Smart provides clear calls, with clean voice and music quality for your ears, and a wind protected microphone and noise reduction technology for your voice. The neckband also holds the controls, with a pair of buttons on the right side to adjust the volume and skip tracks, plus a multi-function button for power, play/pause, and call answer/end. A dedicated Voice button on the other side provides direct access to Apple Siri or Google Now on Android, and mutes when on a voice call. You also hear Voice Guidance spoken prompts that provide guidance for actions including pairing, connection, and battery status. The Halo Smart is quite comfortable to wear, weighing only 1.34 oz (38 g). The neckband flexes to fit larger necks, and therefore can be worn either inside or outside a shirt. It also is wind and water resistant, although it's not really made for use during exercise, since the neckband will be rubbing against your sweaty skin. The Jabra Halo Smart neckband Bluetooth headphones are available in black for $79. 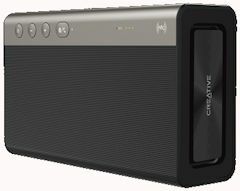 The Creative iRoar Bluetooth speaker is a ridiculously powerful and full-featured box o' sound. This is a booming speaker with 5 drivers. Lay it on its side for maximum sound, with dual 2" high-frequency drivers facing out the side, an active 2.75" bass driver directed upwards, and two side-firing passive radiators on the ends to enhance the bass and widen the soundstage. Yes, it is not petite at 8.8 x 4.7 x 2.2 inches and 2.5 lbs, nor is it inexpensive at $369. 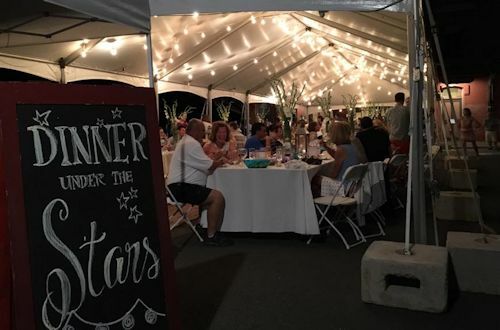 But it really delivers as a powerful and portable speaker for use indoors or out, as demonstrated when it provided the music for the recent "Dinner Under The Stars" event as part of our town's 125th Anniversary celebration -- a three-hour outdoor gathering with seating for 125 people. "The sound was terrific," reports the celebration's chair. "For such a small unit the depth and quality of the sound produced was amazing." "We played a variety of mood music to allow for conversation during the cocktail hour, and then switched to background music during dinner. The speaker handled the various volumes and quality we needed beautifully." "All in all," she concludes, "I would highly recommend this unit for both indoor and outdoor events due to the high quality of the sound, the compact size, and long battery life." 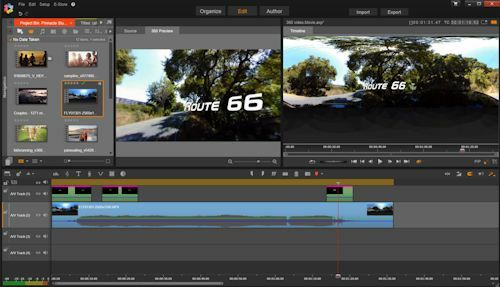 The new Pinnacle Studio 20 has been released, featuring support for editing 360-degree video (aka immersive or spherical or VR videos -- see Wikipedia on 360-degree video, and the YouTube 360° Videos channel). Pinnacle regards this as a first cut at editing for 360-degree videos, so you can experiment with taking advantage of these new cameras -- for example, doing virtual exploration of a space or event, or getting the full experience from an action cam experience. You can start with cleaning up and enhancing the full-size (but distorted) 360 video frame, and then adding titles and other graphics in the "360-degree" video space, so they look straight when you explore the space by projecting into a standard-size window. Studio also has a nice feature to extract a standard video from the 360 video, which works much like multi-cam -- you dynamically pan a window around the video while it plays, and Studio then saves the result as a timeline that you then can edit further. Studio version 20 is the latest in a long line of video tools -- Corel acquired the Pinnacle Studio line from Avid in 2012, joining its previous acquisition of VideoStudio (for consumer editing, from InterVideo / Ulead in 2006), and Roxio and its Creator line (from Rovi, also in 2012). Corel positions Pinnacle Studio as a step beyond VideoStudio, targeting Studio to video editing enthusiasts who want to focus on editing beyond casual use, and who therefore need "the control, innovative features and advanced capabilities" that bring you "closer to professional results." Studio 20 therefore adds other advanced features seen in VideoStudio and other editors, including multi-point motion tracking, with mosaic blur to obscure faces or signs, and stop-motion support for Canon or Nikon DSLR cameras (including overlays to help position each frame). It also adds import/export support for HEVC (H.265) video, using hardware support from Intel 6th generation or specific NVIDIA cards. The Standard edition starts at $59, and supports 6-track editing and 2-camera multi-cam editing. The Plus edition for $99 steps up to 24-track editing and 4-camera multi-cam, adds features including the new motion tracking and track transparency features, and includes more effects, templates for MyDVD authoring, and other assets. The full-up Ultimate edition for $129 then supports unlimited-track editing and 6-camera multi-cam, provides advanced editing with the new 360-degree support and 4K Ultra HD, and includes more assets along with effects from NewBlue. This is a welcome update to a venerable product, and opens intriguing possibilities for not just shooting 360-degree video, but also editing and enhancing the results. Entries posted to Manifest Tech Blog in August 2016, listed from oldest to newest.